Many different types of industries rely on hydraulic systems to operate essential equipment and machinery. There are many businesses in the Greater Fall River area that use hydraulic equipment, including industrial, marine, agricultural, construction, manufacturing, and much more. If you require top-quality, reliable hydraulic hose services in Southeastern Massachusetts and Rhode Island, you can count on LaCava Brothers Auto Parts Store in Fall River. Our team can hook you up with our hydraulic hose services, which are available seven days a week. Our technicians have many years of experience working with custom hydraulic hoses in the Greater Fall River area, and we have worked with clients across just about every industry. While there are many manufacturers out there that make hydraulic hoses and parts for hydraulic hose assemblies, at LaCava Auto Parts & Services, we trust Gates. We only use Gates products due to their proven track record for providing top quality results. Gates has been a leader in hydraulic hoses since 1911, offering options for custom hydraulic hoses to provide the ultimate fluid conveyance system. Choose from a wide range of pressure ranges and abrasion resistance, depending on your needs and the environment where your equipment is located. Every hydraulic hose assembly that we build is designed with long-lasting, high-performance applications in mind. The MegaCrimp couplings that we use from Gates offer up to 500 percent better corrosion resistance than other manufacturers. Our customers rely on LaCava Brothers for top quality results, and we trust Gates to uphold our reputation. So whether you need a standard size hydraulic hose for your equipment or require something more custom, our team can help you seven days a week with our professional hydraulic hose services. 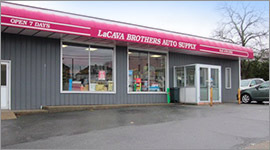 For over 70 years, LaCava Brothers auto parts store in Fall River has provided the Greater Fall River area with quality automotive parts and services. From day one we have been family owned and operated to provide our customers with the best service available. For more than 75 years, LaCava Brothers Auto Parts Store in Fall River has provided top-notch quality services to our customers in Southeastern Massachusetts and Rhode Island. We serve individual customers, as well as business and commercial accounts. We carry a full line of foreign and domestic parts, including top name brands such as Monroe, Wagner, Walker, Delphi, Wells, AC Delco, Motorcraft, Pennzoil, Moog, Gates, and much more. Our team of knowledgable staff is waiting to assist you with all of your needs for hydraulic hose services, auto parts purchasing, and more. Whether you work in a professional auto shop or your home garage, you can count on our auto parts store in Fall River to deliver the very best in parts, tools, products, and services. 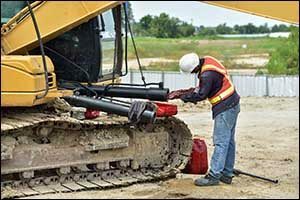 Industrial, construction, and other heavy-duty equipment relies heavily on hydraulic hose services to perform. Making sure that your hydraulic hose assemblies are in safe and proper working order is essential to reduce or eliminate downtime due to failure. Regular inspections, according to local, state, and federal safety guidelines, as well as safe replacement techniques will go a long way toward keeping your work environment safe and productive for you and your team. When you hire LaCava Brothers for hydraulic hose services, you can save time and money by outsourcing this service to a reputable and experienced company. When assembling a hydraulic hose, it takes a lot of knowledge and skill to get it done right. A lot is riding on the success of your hydraulic hose replacement, so you will want to make sure that it is done properly. Our team has many years of experience working with hydraulic hose assemblies for our clients, and we can create custom solutions for you to meet or exceed your expectations. Save time by having our team create custom hydraulic hose assemblies for you based on your needs and specifications, while saving money by not having to purchase all of the equipment and tools necessary to properly assemble the hose. Our team already have all of the heavy-duty gear necessary to properly attach all of the fittings, and we have knowledge of the various industrial specifications for popular equipment types that are used across many different industries. In addition to hydraulic hose services, LaCava Auto Parts and Services also carries a wide range of tools, equipment, parts, and products to help you maintain your essential industrial machinery. Give us a call at 508-676-1951 or stop by our location on Bedford Street in Fall River, MA.